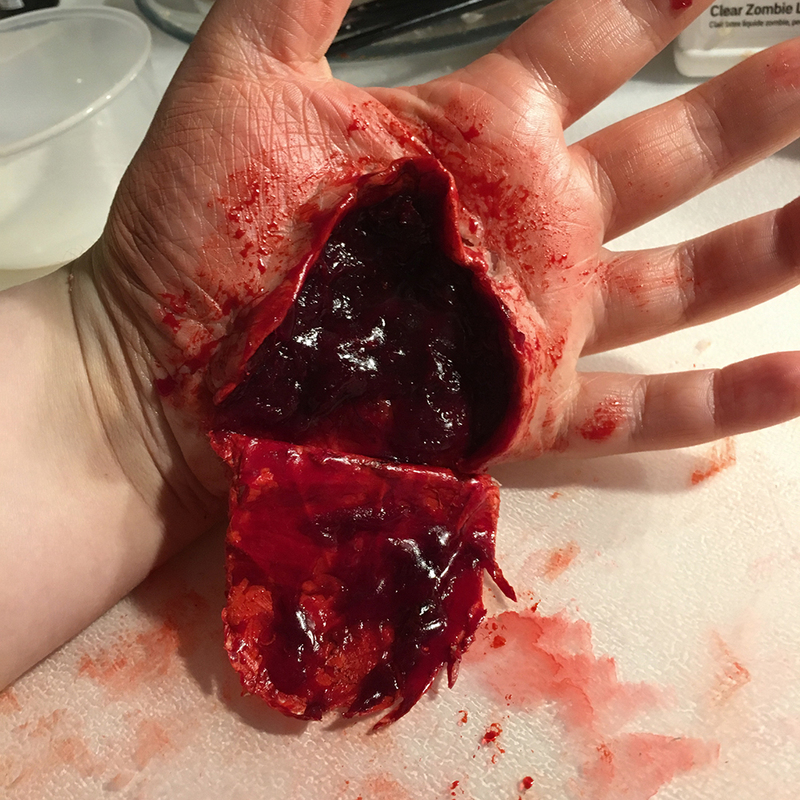 This sfx makeup look with a gag-worthy flap of skin and gory, clotted red matter underneath it is quite easy to make and will leave you impressed with yourself. It almost looks as if you’ve fallen over and scraped the skin off your hand. You can recreate this look anywhere on your body once you learn how, add as much or as little blood as you want, really make it your own! You will also need scab blood, I make my own and will leave an easy recipe at the bottom. Cut up your tissue paper into long semi-circular pieces (depending on how big you want to flap to be). Then, with the latex and disposable sponges, dab a layer of latex onto your hand and apply one piece of the tissue paper. Repeat this process about four times and wait for the latex to fully dry (it will be shiny and tacky to the touch). 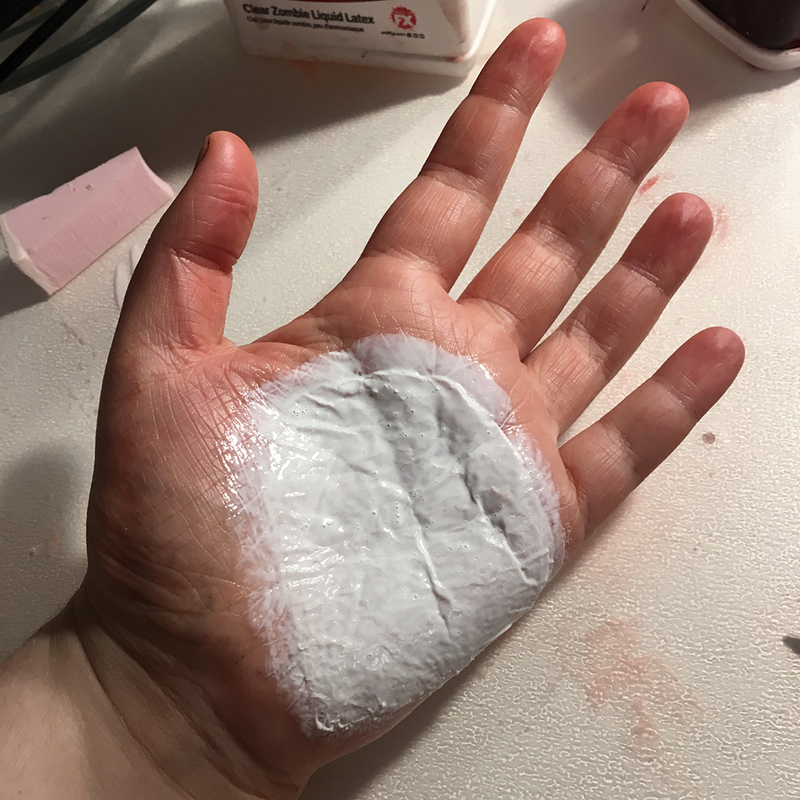 Use a liberal amount of face powder over the area to remove shine and tackiness, and then with your scissors, very carefully make an incision into the latex (I find going along the palm of my hand rather than into it works best) and leave the straight edge in tact to create the flap of skin! Use foundation to give colour to the flap on the outer side, don’t worry about making it look perfect as the inside is more important. Get some scar wax and roll it into a long thin line. 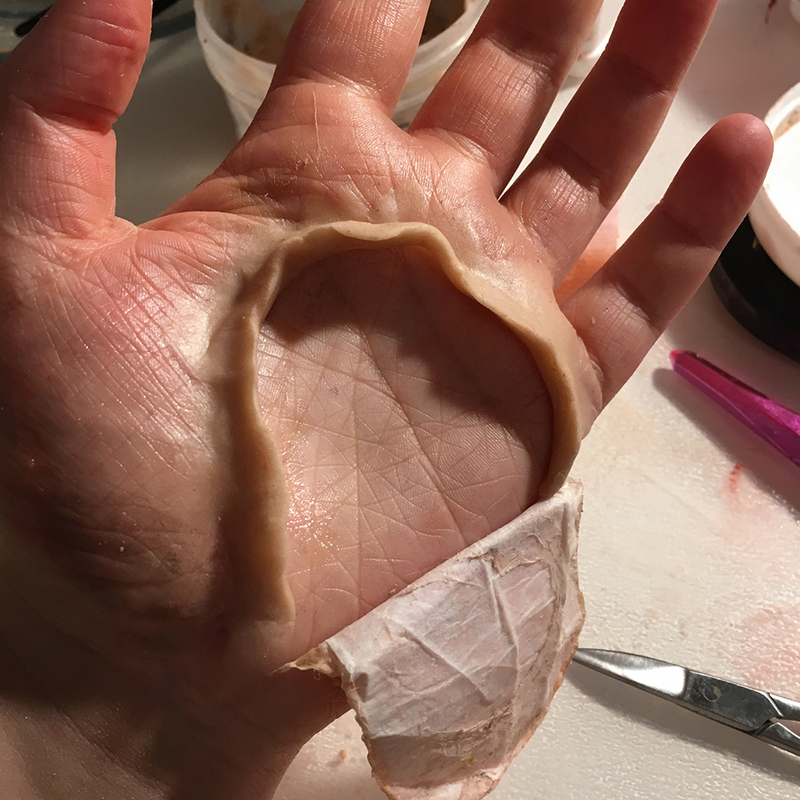 I traced the shape of the flap on my palm so it was roughly the same size as that, and then started to work the wax in. I only blended the outer side of the wax into my hand, so that it looked like the inside was torn. I used Vaseline to blend this even more, and then powdered and applied some foundation. Again, don’t worry about making it look perfect, any imperfections can be covered in fake blood! Using the face paints, I started with brown in the centre of the wound, blending into red as it reached the scar wax. I added a small amount of black to the middle and blended well. Add red to the inner walls of scar wax. Now the fun begins, take your scab blood and apply liberally to this area. I then used red on the inner side of the skin flap and gently placed it back onto my hand so some of the scab blood would transfer onto it. Using the fake blood, use as much or as little as you want over the scab blood, on the skin flap and around the scar wax. As a final touch, I used the scissors to roughen up the edges of the flap, just to make it look more like a natural tear. Your look is now complete! This super gory look is ideal for Halloween, but I just used it to freak people out. 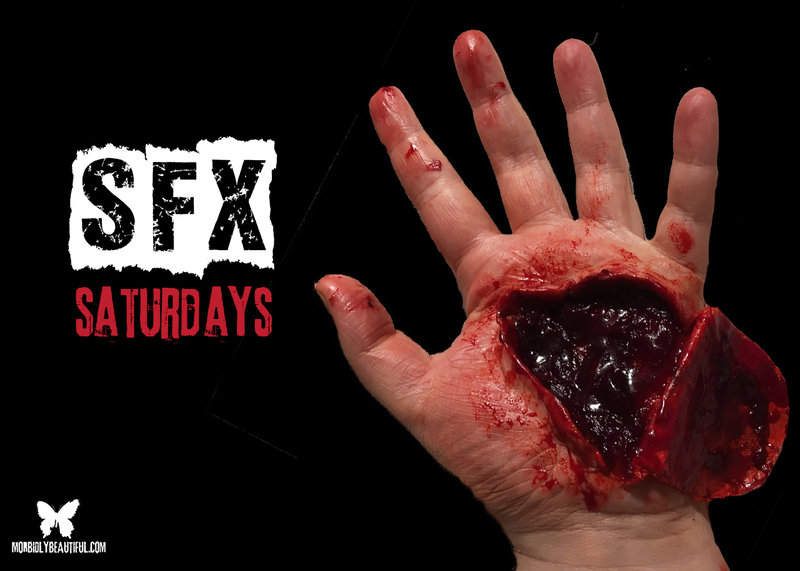 You could try this sfx makeup look on your knee, your cheek or arm, anywhere you want really. Until next time, stay scary! Melt the Vaseline in the microwave, being careful not to burn yourself as it can get VERY hot. Add small amounts of the food coloring (more red than yellow or blue) and keep mixing, when it starts to cool down it will mix properly. Tear apart some cotton with your fingers and keep adding to the Vaseline mixture until it look clotted and thick.